In these times of crisis, photo acquisition budgets have been cut. Art directors and photo editors often cannot afford to send a photographer to cover stories in Spain on gastronomy, wine, popular culture and tourist sights, but that doesn’t mean that you can’t have access to top quality, original photographs of Spain, Spanish travel, Spanish gastronomy, Spanish wine and many, many other subjects covering a broad range of activities (see samples below). And, since I travel in Spain as many as eight times each year, an assignment often does not require re-imbursement for air travel. 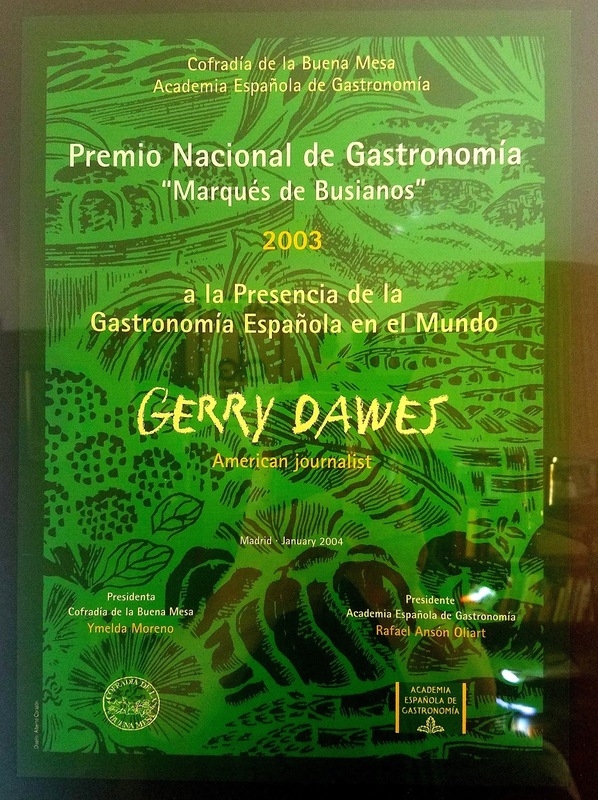 Based in New York's Hudson River Valley, I am Gerry Dawes, an award-winning writer-photographer, who has been traveling or living in Spain for forty years. I have thousands of high quality digital photographs and a library of thousands of transparencies going back more than two decades on a multitude of Spanish subjects. 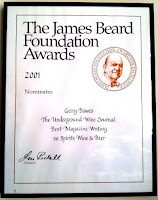 I have published hundreds, if not thousands, of photographs in such publications as Food Arts, The Wine Spectator, The Wine News, The Wine Enthusiast, Santé, Decanter, Saveur and The New York Times. 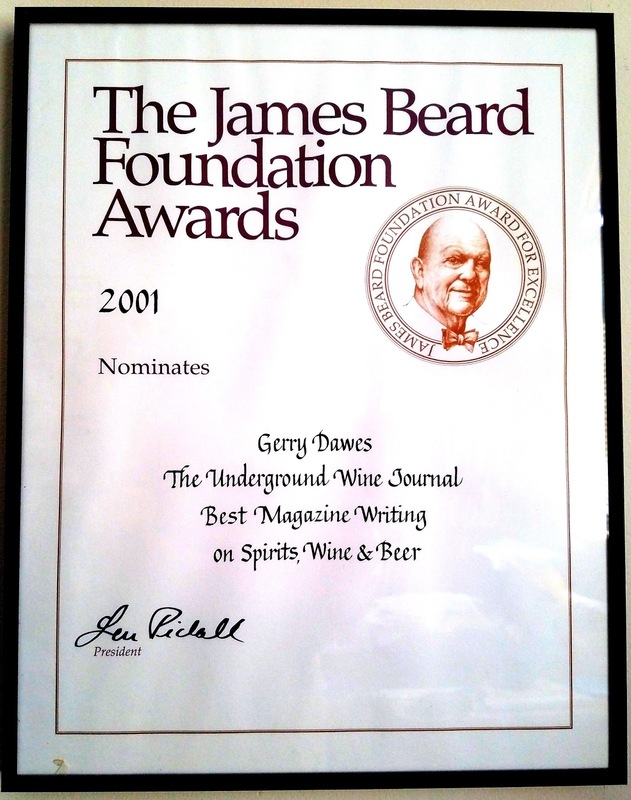 I have had had cover and full-page shots for The Wine Spectator, Wine Enthusiast and Wine News and I have photographs in several books. Numerous photographs of mine can be see with my articles on this blog, on Verema.com and on the new Culinary Institute of America-Greystone website dedicated to Spain. My stock includes thousands of photographs of Spain, taken on an average of seven trips per year to Spain over the past decade. Spanish cocina de vanguardia chefs (Ferran Adri , Arzak, Roca, Dacosta and scores of others), their restaurants and hundreds of dishes. Market photos from Madrid, Barcelona’s La Boqueria, San Sebastián’s La Bretxa, Valencia’s Mercat Central, Mercado de Jerez and others; fish markets; farmer’s markets; gourmet shops; and food producers. Spanish products such as olive oil (and production); hundreds of artisan cheeses (cheesemaking operations and animals that provide the milk); rice, paprika and saffron. Wine, wineries and vineyards from almost every denominación de origen, many of which are isolated or little-known; Spanish wine personalities, star winemakers and little-known winemakers; closeups of wine glasses. Christian and Moorish Castles, ancient synagogues, Roman ruins, cathedrals and village churches, monuments, museums, statues, works of art, train stations, airports. Landscapes: mountains, plains and seacoast. If you don’t see it in this general listing, ask, chances are Dawes's archives may have what you are looking for to illustrate your articles and advertisements. Dawes is also available for assignments and the fact that he is so often in Spain–leading tours, attending and speaking at conferences or just traveling and taking photographs–can mean that the customer may not have the expense of my airfare. All photographs taken with Canon cameras and Tokina 12-24mm f4, Sigma 17-70mm f2.8-4.5, Canon 50mm f1.4, Canon 50mm Macro f2.5 and Canon 70-200mm f4 'L' lenses. 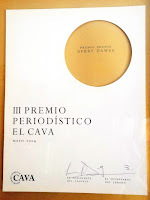 Spanish National Gastronomy Prize: 2003 Marques de Busianos Award from the Spanish Academy of Gastronomia y La Cofradia de la Buena Mesa for activities (writing, photography, lectures) on behalf of Spanish gastronomy and wines. 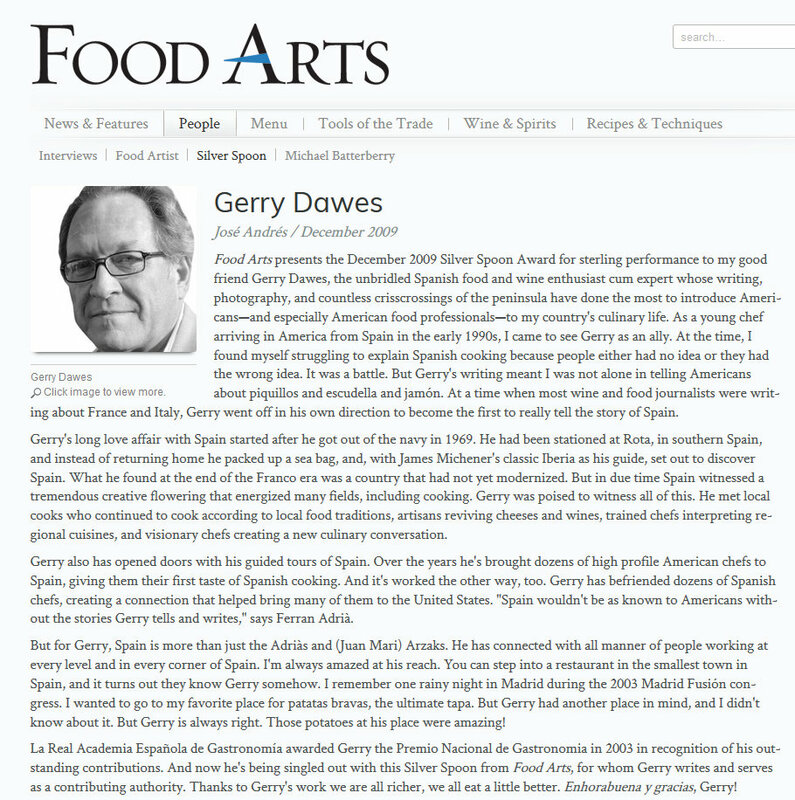 Gerry Dawes was born in Alto Pass, Illinois (pop. 300) and lived in Spain for eight years in sherry country (Cádiz), in Sevilla, and in Mijas (Malaga) and has been traveling there for forty years. He represented the late American artist-matador John Fulton in Sevilla and Marbella; apprenticed under Robert Vavra, photographer of James Michener's Iberia; ran The Dawes Gallery, a contemporary art gallery in Mijas, and studied Spain's language, history, and culture at the University of Sevilla (in the former Fábrica de Tabaco--made famous as the setting of the opera Carmen). Dawes has a B.A. in Spanish and Creative Writing from State University of New York (SUNY). An avid aficionado of Spanish fiestas and a photographer, Dawes traveled extensively in Spain during the eight years he lived there, putting muchos kilómetros on Rocinante, his Volkswagen sedan. He amassed thousands of color transparencies and a wealth of knowledge about the country, its wine and food, customs and culture. Since that time, he has returned to Spain nearly 100 times on gastronomy, wine and photography missions. 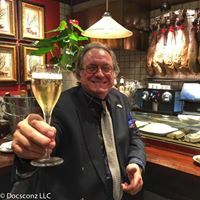 He has also led nearly a dozen customized culinary and wine tours to Spain. "Your long letter about your relationship to my book, Iberia: Spanish Travels and Reflections has finally caught up with me, and it has touched me deeply. 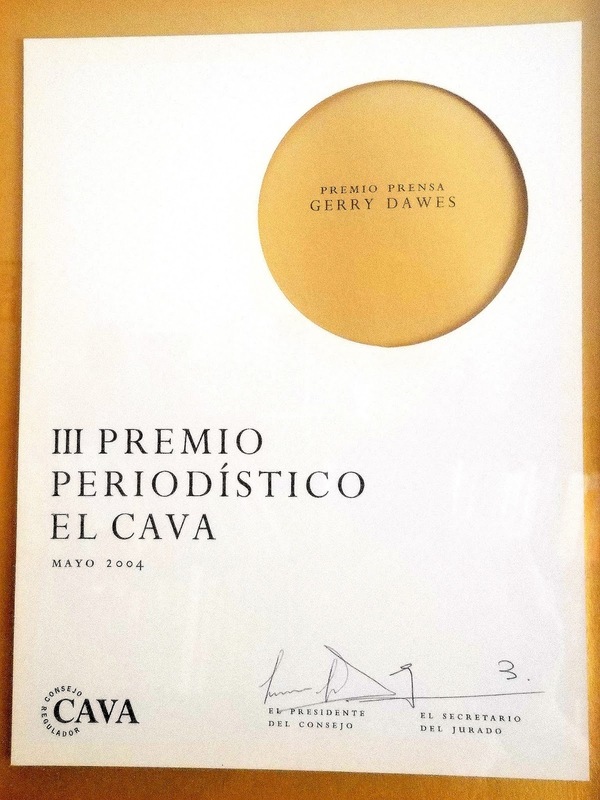 I have received in these later years some dozen letters each year in which someone of apparent good sense and writing skill - - and, in your case, long experience in Spain - - qualified them to make value judgements. A person like me who writes in solitude, rarely sees his readers and profits from specific contact with them. I had been waiting for a letter like yours to come in so that I could respond to it in some detail, and I found in your account of your travel adventures in Spain over a span of nearly thirty years to be what I wanted. I could have used the story of a Canadian who read my book on Japanese prints and decided to go to Japan and become a woodblock artist. He did, and with outstanding success. Or the people who went into archaeology because I made it so attractive, or the lovable ones of the lot, those who simply caught the travel lust from reading my books and went off hightailing it through the world. I hear from them all and from a very wide spread of countries. But, your letter was of a different quality in that you specified how Iberia affected you and what specifically you did about it. You were fresh off a four-year hitch in the Navy during the Vietnam period, standing at the farewell gate at U.S. Naval Headquarters in Rota, Spain, with $500 bucks in your pocket and a determination to see Spain as intimately as this writer guy Michener had done in his youth. Your adventures far exceeded mine in both width and depth. Truly you had a basketful of experiences that made me envious: art gallery manager, college stints at the University of Seville in the old tobacco factory of Carmen, marriage to lovely backpacker from Michigan whom you met in Andalucia, tour guide to back country Andalucian villages, Spanish wine and food expert, and a plunge into the world of adventure, art, history, and bullfighting that I’d described in Iberia. I was impressed by your story about how you and your new friend John Fulton were stuck in Sevilla without a dime between you as the Fiestas de San Fermín at Pamplona approached on the 7 of July for eight wild days, and how you met a large group of affluent-looking American college students in Sevilla’s labyrinthine streets and arranged an impromptu tapas and sangría party at your house in the Barrio de Santa Cruz, the old Jewish Quarter, so they could meet Fulton and buy copies of his artwork. You earned enough money that night to permit you both to scurry off to Pamplona, where you met many of the characters in Iberia, joined in their wonderful tertulias, and had your hair-raising adventure in the encierro, the running of the bulls. That story and the way you told it made me think that you would be a pretty fair writer. 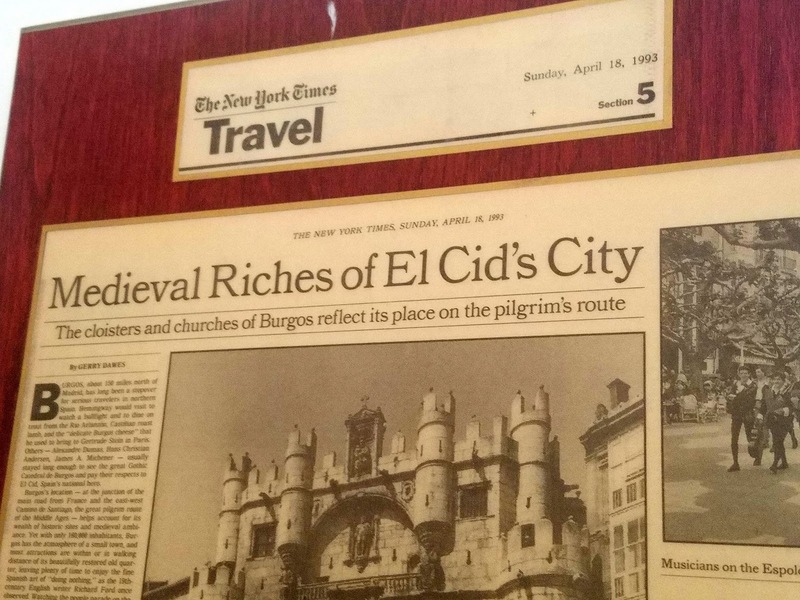 In your thirty years of "wandering the back roads of Spain," you have built up a much stronger bank of experiences than I had to rely on when I started writing Iberia. It was good to hear of your intellectual adventures as well and I am honored that Iberia had such a profound effect on your life and writings. Do you realize that because of the time you spent in Spain, both in the Navy and in those early years after your discharge, that you knew those characters of Pamplona and Sevilla and the bullfight aficionados better than I ever did? And what a scintillating group they were, and how privileged we both were to have know them. I am flattered that I have inspired you to pick up where I left off and write Homage to Iberia. The continuing saga of Spain, its people, and the wonderful characters who love this vibrant country deserves to be told.